Introducing the Kyozou Webstore eCommerce platform. Developed as a feature rich ecommerce solution that makes setting up your very own ecommerce store easier than ever. The Kyozou Webstore gives you the ability to quickly integrate eBay or multi-channel inventory to your very own webstore in no time at all. This ecommerce listing management software allows you to expand your reach with this additional sales channel. A company’s online identity is essential for a successful webstore. At Kyozou we have you covered with the ability to design custom Kyozou Webstores, logo’s and banners. We can even assist with eBay listing templates and eBay store templates. With a quick turnaround time Kyozou will design exactly what you need in order to build your company’s strong online presence. Create a private marketplace to make selling wholesale a breeze. Keep your prices and inventory private and sell your products on an invite-only webstore. Kyozou is flexible and can be setup to run both a Private Marketplace Kyozou Webstore and a standard Kyozou Webstore all from the same warehouse. 3 tier pricing allows a seller to have up to 3 different prices for Kyozou Webstore products. Essentially the public can see a standard price, when a member logs into the Webstore they can see a second tier of pricing and a VIP customer can login and see the 3rd tier of pricing. With 3 tier pricing we can automate the pricing based on percentages of the main price of the product and control what customers see what set of pricing. Kyozou works with a variety of shopping comparison sites to drive traffic, getting your inventory seen by thousands of potential customers all over the world. Working with popular social media plugin Addthis, the Kyozou Webstore platform is able to showcase popular social media outlets for customers to share inventory to their friends and followers. Newsletters are a key strategy to driving traffic to a webstore. With the newsletter sign up form, sellers can start creating a list for sending out newsletters. Working with a CSM (Customer Success Manager) Kyozou can assist with setting up newsletter campaigns to advertise new products or sales for a Kyozou Webstore. 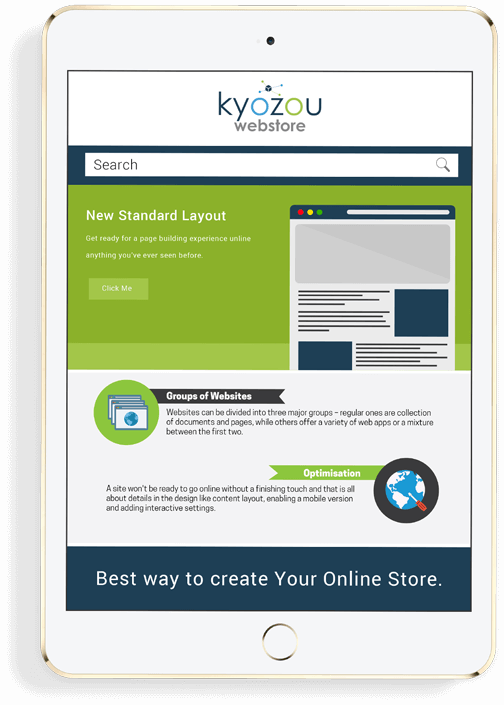 All Kyozou Webstore templates are responsive design friendly, making the entire platform mobile friendly. With recent updates to Google’s search algorithm and ebay removing active content, it is essential that all websites are mobile friendly and with the Kyozou Webstore platform responsive designed templates we’ve got it covered.